Mid Drive systems apply power directly to the Bottom Bracket (BB) thus replacing the BB & crank arms. This allows the motor to drive through the chain which gives the benefit of a range of gear ratios, which in turn greatly improves the efficiency. 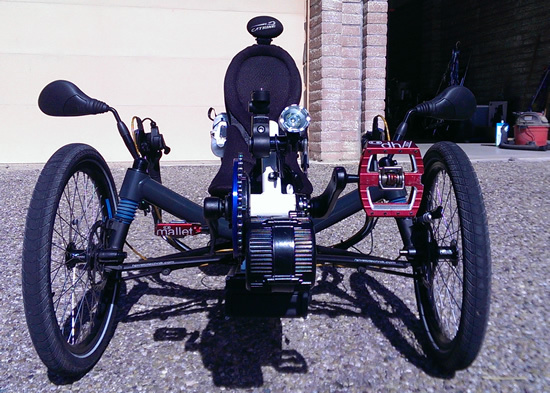 By putting the additional weight at the lowest point mid way between the wheels on a bike really enhances the handling over a Hubmotor, however on a trike the weight is moved all the way forward which can be a problem for shorter wheelbase trikes, or those trikes that tend to lift the rear wheel under hard braking. Some Catrike owners understand the meaning of "stoppie" all to well. Being somewhat recent to the E-Bike evolution, there are a handful of Mid Drive systems ranging from 350 to 3000 watts in power. Some are a direct BB replacement while others require a custom BB housing and mount which prevents them from being sold as aftermarket. To be fair there is a significant level of torque generated in the round BB and adding an anti-rotation lever to a bike isn't an easy task. Some Mid Drive systems that can mount under the seat and drive the rear wheel via a separate chain/belt but are beyond the scope of this article. If it weren't for the Bafang BBS02 and the recommendation that it was added to the list its not likely Mid Drives would have been added to this project. There had been some preliminary investigation into some of these systems, but having secondary chains and belts as a form of gear reduction just seemed kind of a "Mickey Mouse" method of designing a drive. There are a few really nice Mid Drive systems from Bosch, Yamaha, Panasonic, even Shimano that offer a nicely packaged and feature rich solutions except for the fact they require a custom BB mounting. Bafang pretty much set the standards for aftermarket Mid Drive upgrade systems so the focus of this article will be on the BBS02. At the end of the article there is a list of other Mid Drives with basic specifications. Mounting the BBS02 on an HPV FS 26 worked pretty well overall. The BBS02 doesn't screw into the BB threads like a standard BB bearing does, it sort of clamps on; to avoid damaging the delicate inside threads a new boom was ordered to mount. Its possible that it would change back to a standard BB at a later date, and having the ability to swap booms was a good plan. To keep the weight as low as possible the motor was mounted on the bottom. To avoid torque rotation the outer faces of the BB tube were sanded to bare metal and tiny notches were filed to line up with the teeth on the lock plate. The BBS02 is very nicely self contained as a tidy package and quite lightweight at 9.2 lbs complete with C965 vertical display. They offer different windings for 36 and 48 volts so be sure to match the battery. To accommodate the width of the motor yet retain a "normal" span between the pedals, the chainring is offset about 3/8" which requires a non-standard chainring. This one is equipped with the 42T Lekkie Bling Ring. The HPV FS26 has a 36-11 10 speed cassette with an SRAM DD3 Dualdrive with a Gear Inch range of 22-136 (610%). 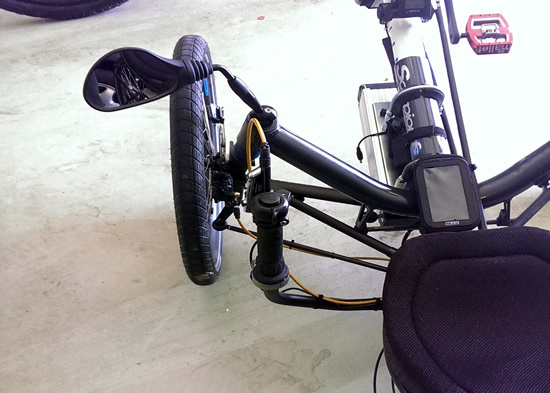 Haibike also used the DD3 on with a Bosch Mid Drive with a rated 80 NM of torque. As the BBS02 has 120 NM @ 750 watt settings it was scaled back to 500 watts. To avoid "axle slip" on the DD3 two locktabs were used rather then the standard single locktab. There are some aftermarket goodies like adapters that will mount standard chainrings with an offset and it is possible to install a dual chainring. That configuration will require careful selection of front derailleur that has enough reach as the chainline will be offset 3/8" outwards. 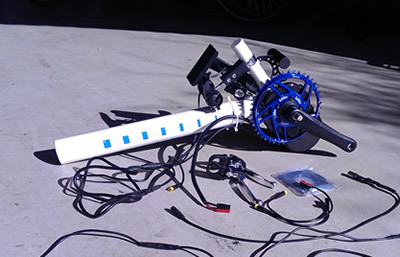 Since recumbents use an Idler under the seat with a longer span the chain should behave, where on a DF using a dual chainring the chain will sometimes come off the chainring. Control for the BBS02 is either with throttle (which overrides PAS) or Cadence Sensing Pedal-Assist (PAS). Cadence Sensing PAS on most systems is "clunky" at best however Bafang has done an excellent job at correcting typical weaknesses. There are 5 PAS settings on the control buttons and the unit can also be programmed to tailor the PAS settings to the rider's needs. Normally Cadence PAS systems must have brake lever switches to disable the PAS quickly for emergency stops. The BBS02 stops power almost immediately when pedals stop. There are programmable variables which were set to cut power completely within 1/4 second. Its not a problem for braking as the brakes will easily overcome the motor power, its more for shifting. As a result the brake lever switches were never connected to the front brakes, and never missed. You can also backpedal and within a 1/4 turn the power is cut. I did connect the parking brake switch just to give a disable of PAS as the control buttons were mounted on the boom. Changing gears takes a little practice and technique. 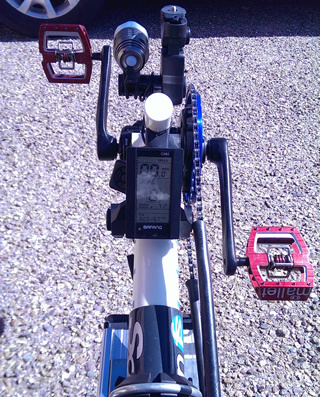 As a Cadence system the RPM is adjustable in the program; it can be up shifted or downshifted under power so long as you're at that upper Cadence level. That means the rider should be keenly aware of their cadence and anticipate gear changes a little more than normal. If you're "busy shifter" like I am, this isn't a problem. Then again I use trigger shifters opposed to bar ends because they respond more quickly and precisely. 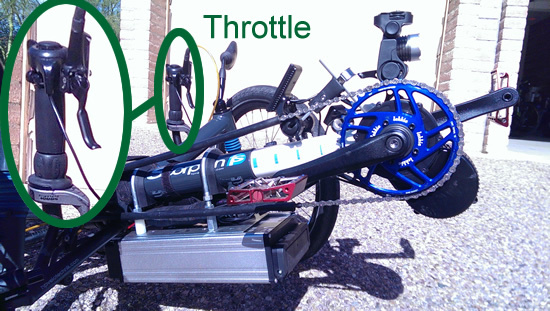 Using throttle only mode works very well so long as the throttle is comfortably positioned. I used the rotary thumb throttle at the top of the left bar and favored that over the PAS most of the time, in part because I shift so much. Unlike a Hubmotor selecting gears is essential. If you suddenly come to a stop on a hill in 5th gear the motor will have to drive the wheel in 5th gear (just as you would with pedaling) to start again. Not only does that limit the torque to the wheel, but if PAS was enabled would create a "crunch-crunch" as the gears are shifted. Again there are some techniques to learn and they will be different for everyone depending on how you set up the controls and programming. Power wise, even at the 500 watt setting the BBS02 was able to climb anything I threw at it. One grade I ride is 17% and climbs over 200 feet. Starting from a stop in 1st gear and hitting the throttle would "chirp" the rear wheel and by the top of the hill I was rolling about 14 MPH in a higher gear, no pedaling. I do cut power with the throttle when climbing hills, but on the flats as long as the motor cadence is above about 90 RPM you don't need to cut power for gear shifts (in throttle only mode). As Cadence levels are programmable the power shifting points will vary with the program settings. Speed was quite surprising particularly with the 500 watt setting. On the flats it was capable of 32 MPH, about the same speed as the Magic Pie 4. Despite the 500 watt setting the Cycle Analyst showed 750 watts @ 32 MPH while the Magic Pie showed 1100 watts. The BBS02 will out climb the Magic Pie 4 on grades steeper than about 8-9% but doesn't come close to matching the MAC on even the steepest grades. However the MAC top speed is limited to about 27 MPH @ 800 watts. Even when the BBS02 was set to 750 watts (which is about 1300 watts peak) it never got very warm even in the 100° heat. Max case temp reached 118° despite some abusive long climbs at under 12 MPH. So long as the right gear is chosen its hard to hurt this unit. Once you get used to more manual nature of shifting, the unit was a delight to ride. The biggest weakness to me was the lack of Torque Sensing PAS. However had I been on a tighter budget (and not already had a MAC 10T & Torque Sensing BB) I think the BBS02 offers the best overall value. A few things to be conscious of in choosing a Mid Drive; boom loading is increased by both the motor torque and the added weight. There may be some bending in lighter weight booms that are extended for riders over about 5' 9" tall. Not by a terrible amount that will throw chains, but it will be present. The longer the boom the worse it becomes. The added weight will increase the stresses at the cruciform over bumps. I doubt I would mount one on a Catrike, although an ICE would be okay, and have no hesitation on an HPV due to the larger sized tubing used. On the HPV you'll notice that the 13 Lb battery is also forward, actually centered below the front axle centerline. No worries about stoppies on an FS26, but just about anything else will be better off with the battery mounted behind the seat. Installation is relatively easy, but does require extending the throttle cable if you choose to mount the display on the boom as I did. Bafang will sell throttle extension cables in minimum orders of 500, but no one has them. 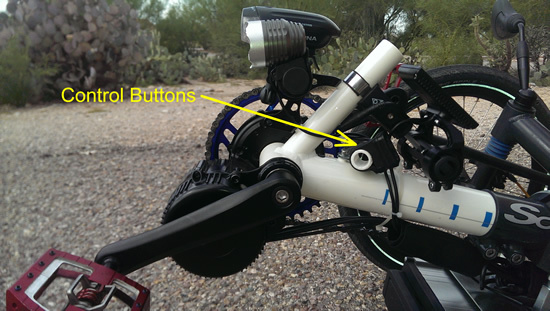 You can snip off one end of the included wired brake lever cables and then snip of one of the brake switch inputs to the motor and join the 3 wires to make a 24" long extension that plugs into the throttle connectors. Or you can simple cut the throttle cable and extend it with 3 pieces of 22AWG wire. Most of the US resellers only carry the 1 foot extension cable for the Speedo, and the Speedo should be set up on the rear wheel. EM3EV has a 1M Speedo extension cable. Definitely order a programming cable as you'll want to fine tune Cadence/Power settings with a PC. Programming Software is pretty user friendly. Other Mid Drives currently available either require special mounting provisions, have exposed secondary chains/belts, excessive power/weight for boom mounting or are generally unavailable as an aftermarket kit in the USA.